it’s unusually clean here-the kids like to mess it up by making things…. 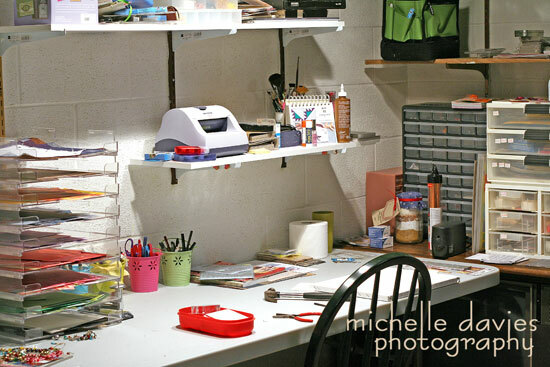 now my sewing area…that’s a mess! >… can I come play in your room? – our’s is too messy right now! Actually I don’t know how to keep it clean. We love to create (daughter and I) so there is NEVER opportunity or desire to stop and straighten up … lolYou have great light here! >love your ‘spot’! like all your containers and pink and green. it’s great you have your own space to play! >A bomb shelter, cool! Some of the houses in the neighborhood I grew up in had bomb shelters, they were dark and scary, not at all like your great scrap space.